Saturn SA-6 and SA-7 were orbital test flights of the Saturn-IV upper stage of the Saturn-1 (Block-2) launch vehicle. They consisted of an Apollo Boilerplate attached to the Saturn-IV stage. 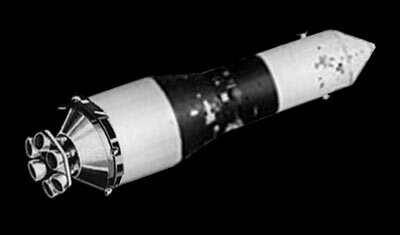 The Apollo Boilerplate was not separated in orbit. On mission Saturn SA-6, one of the eight first-stage H-1 engines shut off 24 seconds early, but the remaining seven engines burned an additional two seconds to compensate, and the guidance system corrected for course deviations resulting in a final orbit very close to the predicted orbit. Eight movie cameras mounted on the Saturn-1 recorded propulsion and fuel operations, were ejected, and recovered. Venting of residual propellants in orbit caused the spacecraft to spin at rate of 28° per second, which was faster than desired. All spacecraft systems operated flawless during the flight. Telemetry was obtained from 106 measurements until end of battery life on the fourth orbit. The spacecraft re-entered Earth's atmosphere on 1 June 1964 on its 50th orbit. Saturn SA-7 was similar to the precedessor flight. An elaborate system of eight motion picture cameras and one TV camera was mounted on first stage to record flight events, but the cameras ejected after the S-1 powered flight were not recovered. Telemetry was obtained from 131 separate and continuous measurements. All test objectives were met, including final verification of the Saturn-1 propulsion, guidance, and structural systems, development testing of the Apollo spacecraft during atmospheric exit, test jettisoning of the CSM launch escape system, and compatibility of the CSM with the launch system The spacecraft orbit decayed on 22 September 1964 after 59 orbits.